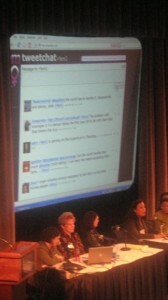 Were you with us a few years back for the Fem2.0 conference? What about our 2010 Wake Up! Campaign? Well if you missed out, don’t fret! Fem2.0 has plenty of events for you to get involved with now, and in the future. We are launching new online and offline opportunities and in the coming months those will include campaigns, volunteer opportunities, internship positions, and of course, more Tweet Chats! Keep an eye for all the ways to get involved with Fem2.0 and become a part of our community. Domestic Violence Awareness Month, dedicated to recognizing the signs of domestic violence and how to offer help and support to friends, family, or other loved ones who may need it. –Domestic Violence Awareness Month: All throughout the month of October Fem2 hosted Tweetchats, wrote blogs, and attended events (including a flashmob!) to honor DV awareness month and spread the word that we’re fighting for a cause, and don’t plan on stopping soon. Take a closer look at everything we’ve done. Interested in Blogging with Fem2, writing a guest post, or submitting a cross-post request? Check out our guidelines and FAQs below and then email us to become part of our blogging community! How long should the piece be? We generally post pieces that are between 500 and 800 words, rarely more than 1000. How do you categorize posts? Fem2pt0 divides our posts up into several categories: Advertising, Arts and Entertainment, Economics & Finance, Families and Caregiving, Fem2 Events, Global Issues, Health, Lifestyle and Relationships, Politics and Public Policy, Pop Culture, Reproductive Rights and Abortion, Security and Defense, Sports, Violence Against Women, & Work and Careers. Every Friday, Fem2pt0 hosts a column dedicated solely to women’s professional development. During the week, our community poses questions using the hashtag #Fem2JobQ, and we post responses from experts across the country. We also post personal stories about professional development, so if you think our community can learn something about an experience of yours, send us your story! Would You Recognize the Devil If He Came to Your Door? Do you provide compensation for blog posts? We hate to be part of the establishment that doesn’t pay writers – particularly female writers – what they’re worth, but sadly Fem2.0 is not in a position to pay for blog posts. Additional Questions? Send us an email or a tweet and we’ll get right back to you!